This thing began as a love for chili, especially on those colder days. What was once just a small effort for change has evolved into a lasting movement to foster more than ourselves by supporting our community. 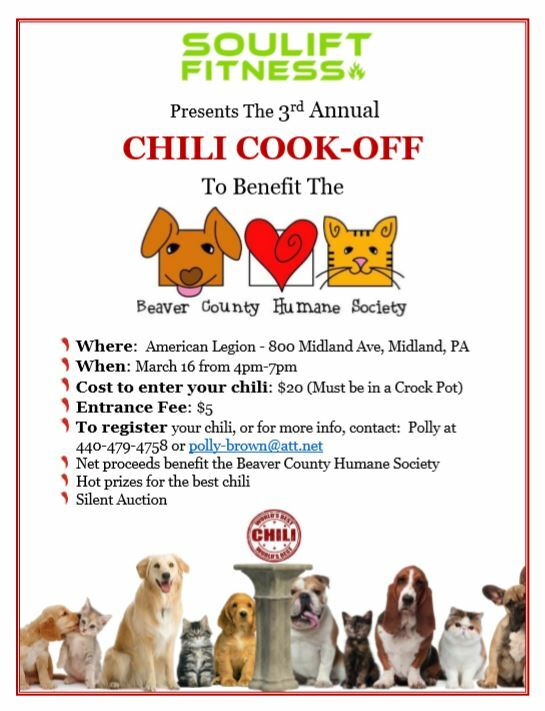 2019 is looking to be a great year for SouLift Fitness, the Chili Cook-off, and especially the Beaver County Humane Society! Based on our success the last couple of years, our goal this time is to raise $3000! It all started in 2017. We took a simple approach by asking SouLift Fitness gym members and friends to make their best pot of chili, so we could vote for a winner with our coins and dollar bills. There were cornbread muffins on sale, and a trophy for the winner to be proud of. We raised a little over $400 our first year! The following year, we more than doubled our donation to the Beaver County Humane Society, and the winning chili just happened to be a vegan recipe! We added a Chinese raffle with prizes that were donated from a group of local businesses, and we had a delicious bake sale. This year’s event will be bigger and better than ever! There have already been more donations for the raffle than before, and we have some awesome prizes for this year’s winner! It’s looking to be a fun night with great food and amazing people, so, mark your calendars for March 16th 2019! The event will run from 4 pm to 7 pm at the American Legion in Midland, PA (800 Midland Avenue Midland, PA 15059). The cost is only $20 to enter your chili and $5 at the door to be a taster, and don’t forget your cash to vote for your favorite chili! Remember ALL proceeds will go to the Beaver County Humane Society. For questions, to sign up to enter your chili in the cook-off, or if you are interested in donating for our Chinese raffle, please call or email Polly at 440-479-4758 or polly-brown@att.net. SouLift Fitness Gym provides the opportunity for physical, mental, and spiritual growth. Through nutrition planning, deliberate activity, and camaraderie, this group boosts personal confidence and an inclusive spirit that extends outside of the gym. It makes a lasting impact on the lives of those who are a part of this gym as well as positively affecting the people around us. To learn more, schedule your free consultation on our website today!